Once winter starts here, one can see varieties of citrus fruits in our farmer's market. I love to bake with citrus fruits, especially with dark chocolate. However i want to bake a simple bread rolls flavoured with orange and its was in my to do list since a long. 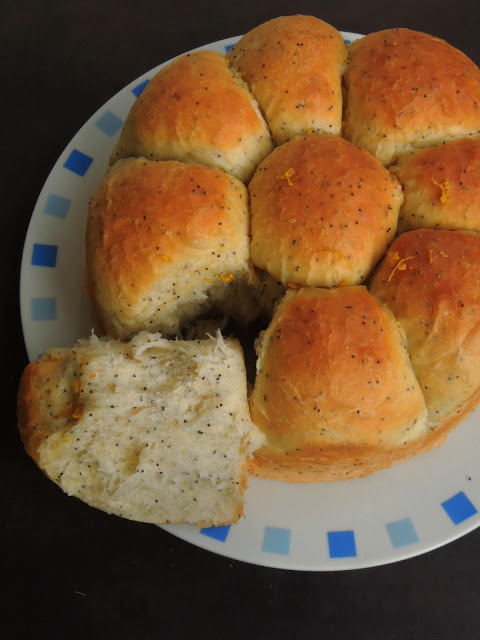 Once oranges showed their heads in our nearby farmers, i couldnt stop myself gathering all the ingredients to bake out some spongy and soft bread rolls with them. 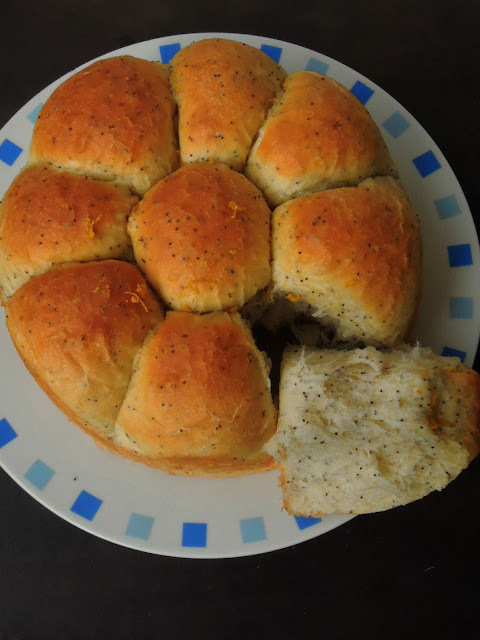 Black poppyseeds is added to this bread rolls to bring some nuttiness and flavour as well. Obviously these bread rolls are super aromatic which can be enjoyed with jam, nutella or else simply with honey. However one can have this bread rolls with any sort of spreads or drinks for their breakfast to snacks. Black poppy seeds are usually combined to bake some tremendous bakes with lemon, but trust me they works prefect with oranges as well. I have already baked some muffins and cakes with this orange and black poppyseeds combination and we loved it. Needless to say that this bread rolls are completely egg free, if you want to bake them as vegan, just skip the milk and butter in this bread. Since i want my bread rolls bit rich, i couldnt stop myself adding both butter and milk. One can mix and match the ingredients in this bread depending upon your tastebuds. You can also bake this bread rolls as swirls, loaf or simply as mini bread rolls by using muffin pan. This bread rolls are going to Bake-a-Thon, a yearly event am running during this whole month of december only on Mondays, Wednesdays and Fridays. Take the orange juice, milk,sugar, salt,poppyseeds, oil,orange zest in a large bowl, add in 1cup of flour and yeast, mix well until it turns smooth. Mix in the cold butter and the remaining flour in an another bowl,mix with finger tips until the flour ressembles like bread crumb. Add this mixture to the already prepared batter and knead well as a smooth dough. Cover with a wet towel and let it rise for half an hour or till the dough double the size. Punch the air and knead for few minutes. Divide the dough as 8 medium sized balls, knead them well and shape them as round balls. Grease a round baking pan, drop the rolled balls one by one. Cover it and let it sit again for 30 minutes. Meanwhile mix the melted butter with a teaspoon of orange zest. Preheat the oven to 350F, brush the rolls with melted butter-orange mixture generously on the top. Bake for 20-25minutes or until the crust turns golden brown. Serve with a cup of tea or coffee. I love citrus in baking,the rolls turned out so good and soft,must be so flavorful. I baked with orange recently and loved the out come. Yours with the poppy seeds have turned out so gorgeous Priya. Seriously Priya, how many should I bookmark?..the texture looks out of the world yaar..so fantastic! 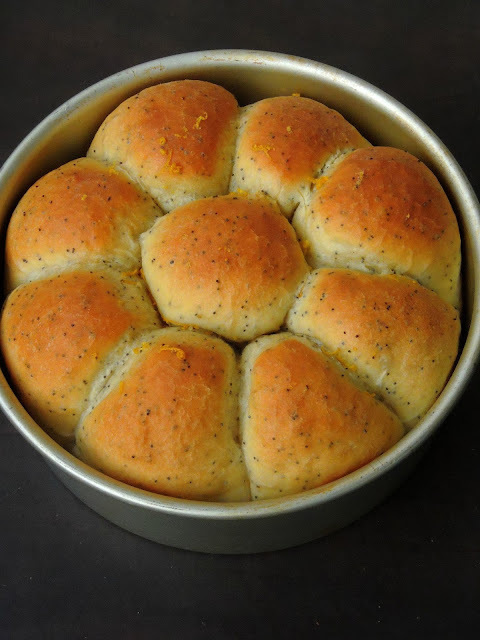 Those citrus flavored rolls with speckles of poppy seeds are looking so inviting. Fabulous texture. 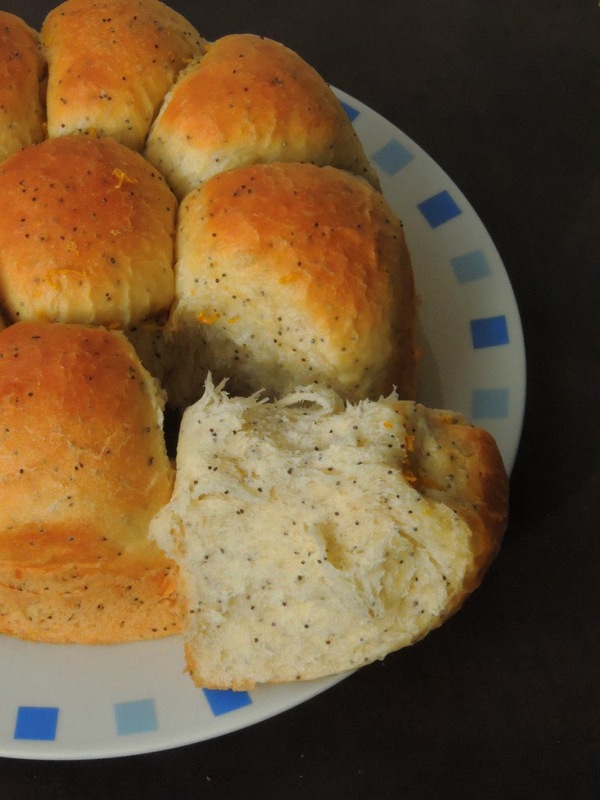 Your citrus and poppy seed rolls sound absolutely delicious. They look so soft and fluffy. Will have to try these some time. Orange juice in bread adds just a refreshing taste. Must try this. I love citrus based bakes and this sounds yum. Love the colour and the texture of the bread. Beautiful buns with poppy seeds, loved the texture. Orange in the buns must have added so much flavor to this beautiful bake. I have baked savoury bakes with Orange and love them.. these pull apart breads are so cute and tempting me to bake them soon ! such a zesty bake priya ! speckled with those pretty poppy seeds! that texture of the rolls is to die for!! I'm in awe with these bread rolls Priya. They have come out so soft and fluffy.